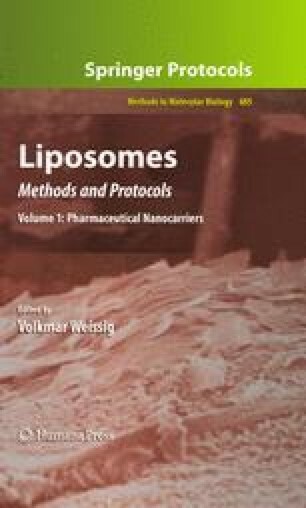 Click chemistry represents a new bioconjugation strategy that can be used to conveniently attach various ligands to the surface of preformed liposomes. This efficient and chemoselective reaction involves a Cu(I)-catalyzed azide-alkyne cycloaddition, which can be performed under mild experimental conditions in aqueous media. Here, we describe the application of a model click reaction to the conjugation, in a single step of unprotected α-1-thiomannosyl ligands, functionalized with an azide group to liposomes containing a terminal alkyne-functionalized lipid anchor. Excellent coupling yields were obtained in the presence of bathophenanthrolinedisulphonate, a water soluble copper-ion chelator, acting as a catalyst. No vesicle leakage was triggered by this conjugation reaction and the coupled mannose ligands were exposed at the surface of the liposomes. The major limitation of Cu(I)-catalyzed click reactions is that this conjugation is restricted to liposomes made of saturated (phospho)lipids. Efficient copper-free azide-alkyne click reactions are, however, being developed, which should alleviate this constraint in the future.